They’ve been gone from New York for 54 years, but they haven’t forgotten us. A $50,000 donation from the San Francisco Giants is helping the city Parks Department rebuild the last remaining bit of the Polo Grounds, the storied ballpark, according to the New York Post. Work is now under way on the $950,000 rebuilding of a stairway that runs from Edgecombe Avenue near 158th Street down to parkland on the western edge of Harlem River Drive, near the old ballpark site. 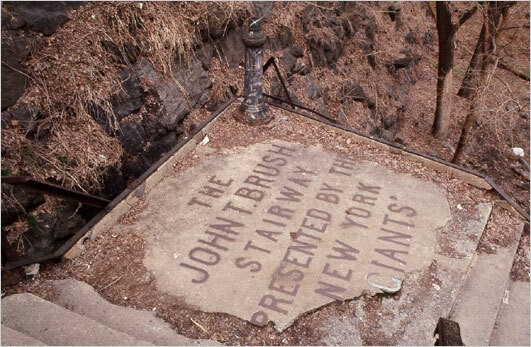 The stairway has a plaque in the middle honoring John T. Brush, who became lead owner of the New York Giants in 1902 and bought the baseball team outright in 1903. The dangerous staircase and surrounding landscape are being finally restored. 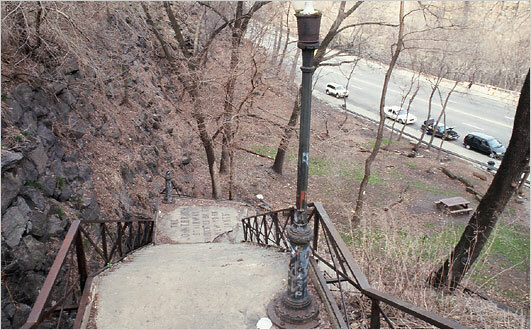 Steps that lead to nowhere today once offered a clear, yet distant, view of games at the Polo Grounds. The biggest chunk of money for the project is a $400,000 allocation of taxpayer funds from Manhattan Borough President Scott Stringer’s capital budget. “We just thought that given its historical significance and its part in Giants history, it would be highly appropriate for us to participate,” said Staci Slaughter, a team spokeswoman. Brush was notorious for boycotting the 1904 World Series, citing the “inferiority” of the newly formed American League. But he changed his mind the following winter and shepherded the Giants to a World Series victory in 1905. Brush owned the team up to his death in 1912. The stairs were built in 1913 and led from a ticket booth on Edgecombe down to the stadium. The upper part of the stairs offered such a good view of the Polo Grounds that fans often crowded it on game days. The stairway is to be finished next September, 100 years after Brush’s death. The project also includes new park benches at the bottom of the stairway, near the highway. The biggest chunk of money for the project is a $400,000 allotment of taxpayer cash from Manhattan Borough President Scott Stringer’s capital budget. The football Giants, who also played at the Polo Grounds, are kicking in $200,000, the Yankees and the Mets are each contributing $100,000, and the Jets and Major League Baseball are each donating $50,000. After the baseball Giants left New York at the end of 1957, the stadium was home to the Mets before the team moved to Queens. The Polo Grounds was torn down in 1964 and is now the site of a housing project. Great to hear that work has begun to restore an important part of not just baseball past but of the city's past. I look forward to walking down those stairs. I will then envision the ghosts of John McGraw, Christy Matthewson, Bobby Thomson, etc. etc. I love it! The stairway is the lingering curse on the San Francisco Giants. Tear the damn thing down.